Many people use the countryside - and for vastly different things. Therefore, a set of rules for the countryside have been prepared. The rules have been drawn up to make a trip to the countryside enjoyable for as many people as possible. Remember that the rules apply primarily for the state-owned part of Rold Skov forest. If you want to go to the privately owned parts of the forest, other rules apply. You can ride your bike on all the paths and forest tracks but not on the forest floor and down steep slopes or on stone dykes and grave mounds. Horse-back riding is free all over the northern part of the state-owned Rold Skov, except for on grave mounds and other prehistoric monuments In the southern part of the forest, south of the line from the Mosskovgård manor house in the east to Mørkehus in the west (1.5 kilometres south of Rold Storkro), riding is only permitted on marked bridleways (marked with a yellow horseshoe). In general dogs must be kept on a leash in the forest. If you let your dog run loose, the Police will be notified. You can let you dog run free in special off-leash dog parks - provided your dog has been trained to come when called. Rold Skov forest and Rebild Bakker are located centrally in the eastern part of Himmerland, south of Støvring and north of Arden. The E45 motorway runs west of the area. Take exit 33 Haverslev (southern part) or 31 Støvring Syd (northern part). 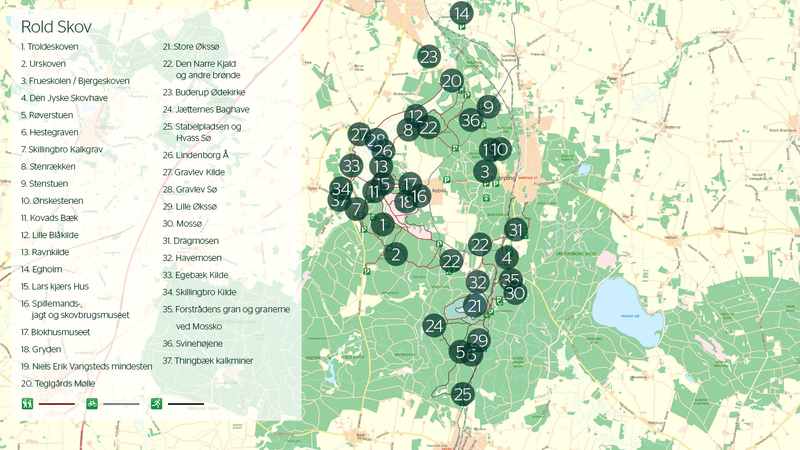 The state-owned part of Rold Skov forest is centrally located in the forest complex and the borders are shown in the map included in the hiking tour leaflet. The Århus to Aalborg railway crosses the forest north-south, and there is a station in Arden and Skørping (IC train and local railway from Aalborg to Skørping). Bus connections stop at the same places as well as at Rebild, Rold, Årestrup, etc.